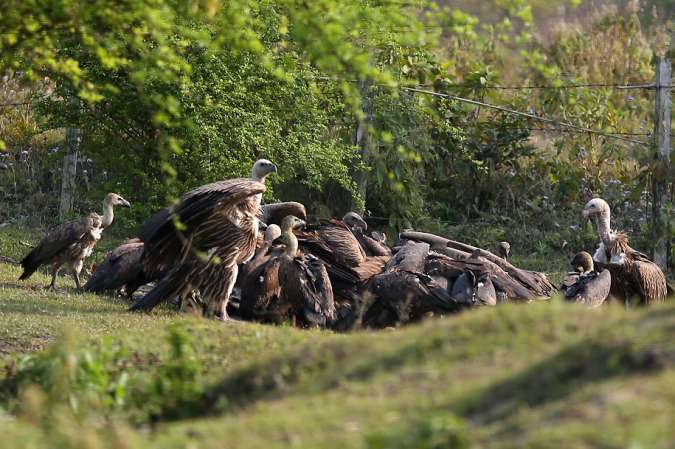 The vulture breeding center of the Chitwan National Park has witnessed 13 eggs laid so far this season by vultures, the engendered bird species. A total of 18 eggs were laid last year at the center, and out of that, only six were hatched. There is likelihood that vultures will lay many eggs in the coming days as vultures start laying eggs from October, said assistant conservation officer at the CNP Bed Bahadur Khadka. Vultures hatch the eggs in 60 to 65 days. The reproduction center has a total of 51 vultures including their six chicks. The government has introduced various programs to conserve the endangered vultures. As part of the programs, vultures are being bred and reared at the center since 2008. The government has also a plan to release 19 vultures into the nature in between 2016 and 2019.